T h e c u b e symbolizes life on earth and the heart Love. 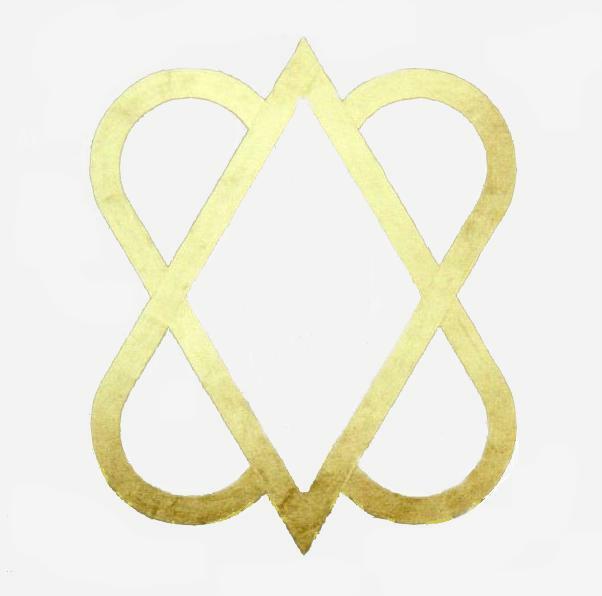 The six hearts on all sides of the cube point to the fact that all aspects of life are based on the essence called Love. The hearts all point to the center of the cube, to a singular point. This means that all aspects of life also lead to a singular point, to God. 61 x 61 cm, acid free paper, € 1.000. 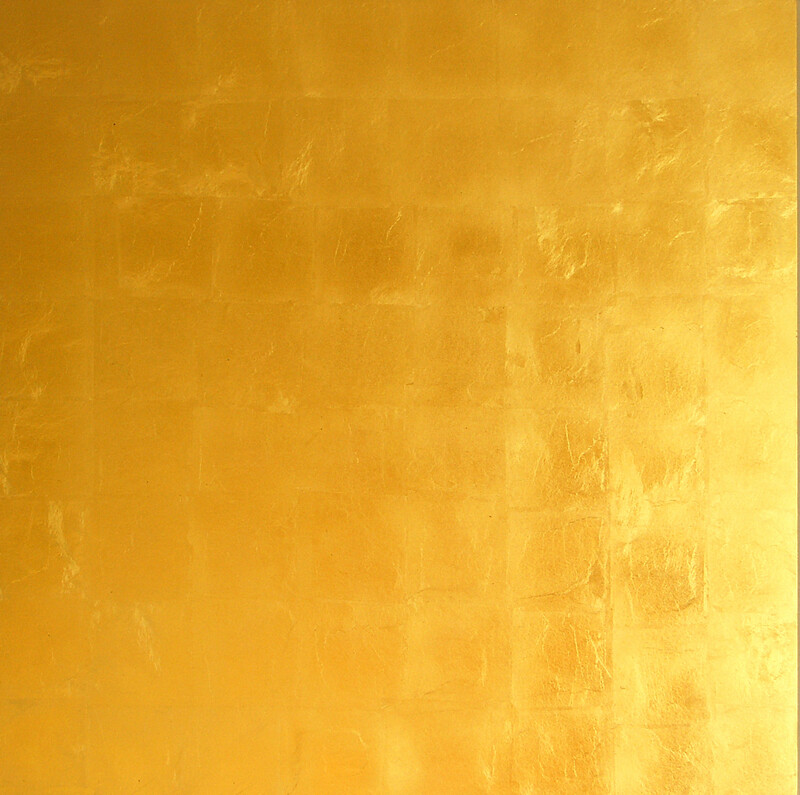 T h e G o l d e n G a t e . Gold and the lack of shape is the most direct way, outside yourself, to God. 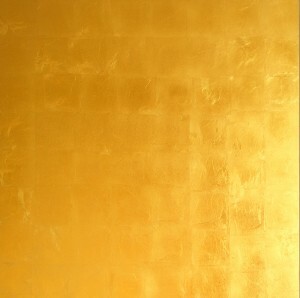 You can not distinguish any form or shape, just gold. It fills the heart by only looking. It is a Love loading station, incredibly powerful and full of Love. 61 x 61 x 4 cm, perspex, € 1.900. 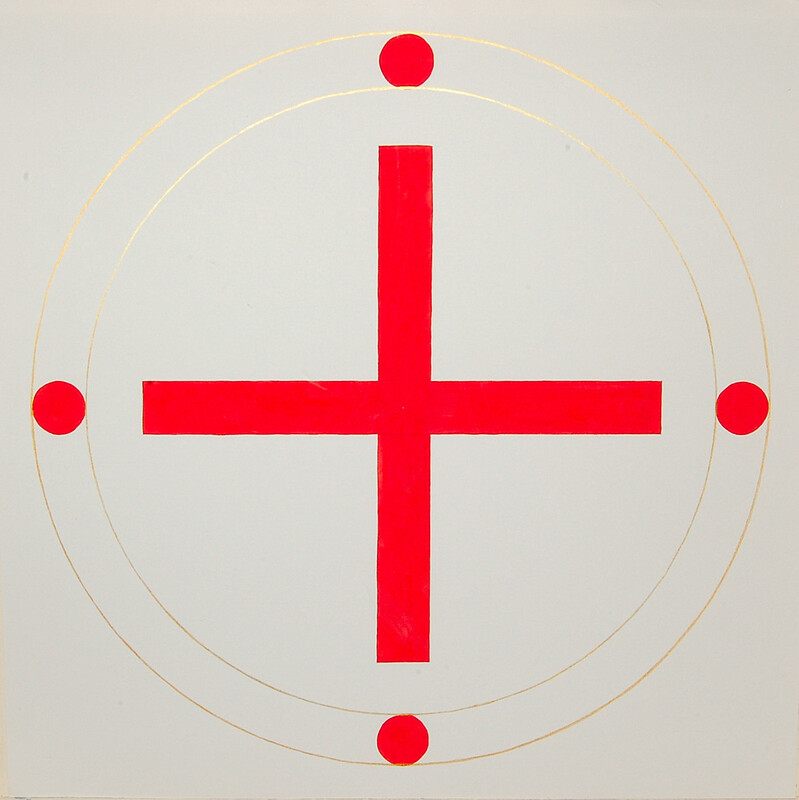 T h e r e d t r i a n g l e symbolizes the spiritual challenge of man, the unification with God. The two corners at the base of the triangle stand for duality, life on earth with all her contradictions. The apex of the triangle stands for non-duality, for being one. The Golden heart and the reversed Golden Triangle represent the omnipresent principle of God. 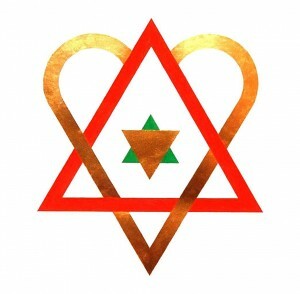 The green and the golden triangle in the centre represent God in the heart of man. This is w h a t o n e a i m s f o r carrying out spiritual work as depicted in the symbol of The Golden Heart. 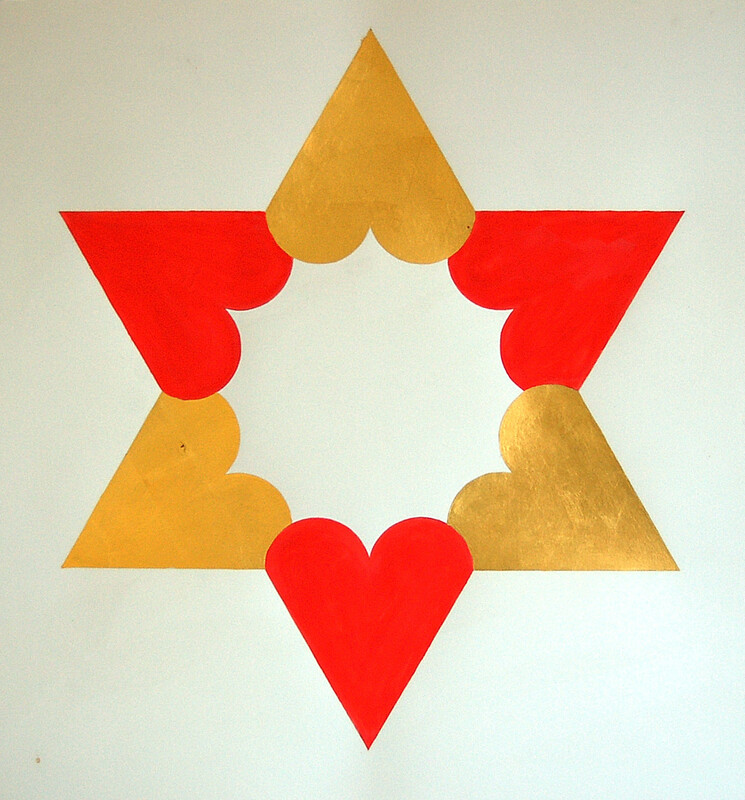 The red triangle has been transformed to a Golden Heart, equal to the Heart of God. The goal has been accomplished. Man and God are unified, together the same. T h e r e d a n d t h e b l u e t r i a n g l e form a shape that is known as the Seal of Salomon or David’s Star. It is a universal symbol that has many meanings and is used in many religions such as Islam, Judaism and Christianity. My explanation is that the triangles stand for the earthly and spiritual man, the hearts at the center of the two triangles again form a cube. T h e y e l l o w l e m n i s c a t e stands for man and the golden one for God. A lemniscate is based on a circle of which half has been folded through180 degrees, forming two equal parts. This means that man and God basically are equal. This is realized and symbolized by unfolding the lemniscate to a circle. The lemniscates are connected in the center, this means when man unfolds spiritually God unfolds in the same way. One knows that the circle is the perfect shape also representing God. S i x u n i f i e d h e a r t s form Salomon’s Seal. It is a universal symbol that has many meanings and is used in many religions such as: Islam, Judaism and Christianity. My explanation is that the red triangle symbolizes spiritual man and the golden one God. S u n a n d s o n phonetically differ only one syllable. The sun is life giving energy, the sun makes life possible and therefore is closely connected to God. The relationship to God is expressed by the son principle. 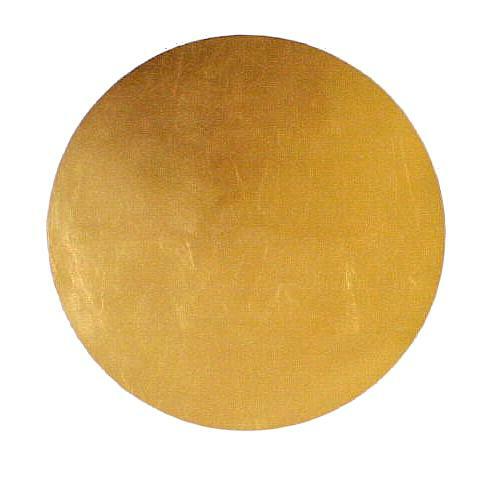 Further more, the globe and the circle symbolize God.